*An updated article is available here: Seamless remote support for Android mobile devices. As the evermore popular bring-your-own-device (BYOD) has changed the IT industry towards greater mobility over the past few years, ISL Online, too, has empowered users to easily connect to remote computers from practically any desktop or mobile device available (Win, Mac, Linux, Android, iOS, Win Mobile). Today, we are proud to introduce secure remote control for Android devices that enables operators to access mobile devices from a computer. With the new Android app, IT professionals are able to support Android phones and tablets remotely and quickly troubleshoot problems with a mobile device right from their own computer. • Retrieve remote system information (CPU, RAM, battery, etc.). *Remotely control Samsung devices running Android 4.2.2 or higher and all rooted Android devices. • use the app in your language (available in 12 languages). 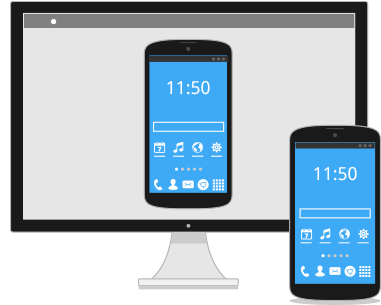 ISL Light 2.0 for Android is an ideal application for BYOD work environments where support requests for Android devices come up daily. The app enables IT professionals to connect from their computer to one or more mobile devices in seconds and manage the data, install enterprise applications or set up the device remotely. To learn all about how to connect to a remote Android phone or a tablet, the mobile user should first download and install the ISL Light Android App, and then follow a simple tutorial in pictures and watch a 2-minute video below. We hope that now you are feeling a little more familiar and comfortable with controlling a mobile device remotely. Enjoy the total mobility the new ISL Light for Android offers and don’t forget to share the news with your co-workers! ISL Online Remote Desktop license includes mobile apps for Android, iOS and Windows 10 Mobile. You can either access a mobile device from a computer and troubleshoot it remotely or the other way around, use your iPhone, iPad, Android phone or tablet to access any remote computer. You’re welcome to sign up for a free trial and try all ISL Online mobile apps. This entry was posted in Android, cross-platform, ISL Light, isl online, remote access, remote desktop support, Remote support, Uncategorized and tagged access android from computer, access android mobile device, access android remotely, access mobile devices, byod support, connect to a mobile device, control mobile device, control remote computers. Bookmark the permalink.